The regulation of substandard or dangerous clinical work by medical practitioners is one of the most challenging areas of medical regulation. There is an important conceptual distinction between poor or suboptimal clinical conduct and the outcome of such conduct. It is also important that harsh sanctions are not imposed by reason of a tragic result for a patient or a perception that no other regulatory response will be acceptable to the community. The line needs to be straddled between maintaining public confidence with stern and robust action being taken to protect the public and maintain standards, on the one hand, and, on the other hand, informed and realistic evaluation of conduct, taking into account the pressures that exist in the real world of clinical practice and the reality that all practitioners are fallible. Debate has been reignited by the decision of the High Court in General Medical Council v Bawa-Garba  WLR (D) 52;  EWHC 76 (Admin) about whether and when gross negligence manslaughter charges constitute a constructive way of rendering doctors accountable and how draconian the regulatory sanctions should be that are imposed when clinical conduct has been found to be “truly exceptionally bad”. Such evaluations need to be conducted in humane recognition of systemic and colleagues’ deficiencies but principally by reference to what needs to be done to ensure responsible, caring and competent medical practice. Medicinal Cannabis in Pregnancy – Panacea or Noxious Weed? The use of medicinal cannabis has been the subject of enabling legislation in Australia since 2016. At present the medical profession has not supported its use for anything but a few indications which include paediatric treatment-resistant epilepsy (especially Dravet’s syndrome), pain syndromes associated with multiple sclerosis, Parkinson’s disease and chemotherapy-induced nausea. However, in the United States where medicinal cannabis has been legalised in 29 States and Washington DC, nausea is an approved indication in many jurisdictions and this has been followed by widespread use for pregnancy-induced nausea and vomiting. This may prove to be ill advised as serious concerns have been expressed about its safety in pregnancy particularly its proven potential to restrict fetal and postnatal growth as well as to impair childhood cognitive functions such as memory, verbal skills and emotional development. These reported effects on neuropsychiatric behavioural and executive functions may influence future adult productivity and lifetime outcomes. Twenty-one States of the United States approve the use of legal cannabis for nausea and vomiting including its use in pregnancy. This is likely to encourage complacency regarding its fetal risks in pregnancy. In Australia the federal and State legislation restricts use of legal cannabis by placing the pharmaceutical under Sch 8 of the Poisons Act 1971 (Tas) which requires specific application for each individual patient use. It is to be hoped that this will prevent the excesses of use in pregnancy witnessed in the United States. On 16 June 2016 the Biosecurity Act 2015 (Cth) came into force. This legislation replaced the Quarantine Act 1908 (Cth) which had regulated biosecurity in Australia for over a century. Impetus for the change arose from a number of reviews (the Nairn Report and later Beale Review) into Australia’s biosecurity system. These identified systemic flaws that were causing the country to be vulnerable to incursions of foreign pests and diseases through the administration of an archaic regulatory regime. The Biosecurity Act 2015 (Cth) includes new terminology, increased powers for the regulator and additional requirements for industry. The responsible agency, the Department of Agriculture and Water Resources, has stated that the new biosecurity laws are designed to be user-friendly, to be flexible and responsive to changes in technology and future challenges, to remove cluttered and confusing sections of the Quarantine Act 1908 (Cth) and to achieve the difficult balance of making biosecurity regulation risk-based and equipping the regulator with strong enforcement powers while also being economically prudent and supportive of increasing Australian trade and market access. This column analyses such claims, including the short, and long-term implications of providing biosecurity officers with two sets of authorising legislative powers and sharing the responsibility of biosecurity emergencies with the Department of Health. Aware of the risk to human development from public health emergencies, governments and international organisations have adopted regulatory measures designed to prepare for and mitigate the risk of global pandemics. However, as the development of the Australian Defence Trade Controls Act 2012 (Cth) reveals, choices in regulatory measures can have profound effects on the delivery of public health and the practice of medical research. Introducing a new regulatory regime for researchers engaged in “dual-use” research, the Defence Trade Controls Act 2012 (Cth) (DTCA) seeks to control a variety of research and teaching activities. This article uses the DTCA as a case study of the “securitization” of infectious diseases, the mechanisms by which biosecurity rules are becoming globalised and the clash of principles that can arise for public health researchers. With the DTCA scheduled for a legislated review in 2018, an awareness of the wider constellation of international and domestic rules restricting dissemination of research findings with national security implications is imperative for public health researchers. This article evaluates whether the National Health Security Act 2007 (Cth) can effectively accommodate public health and national security policy objectives under one Act to meet the biosecurity challenges of the 21st century. The formation of the Act, its substantive parts, and its subsequent amendments are described before the Act is assessed under the Rule of Law analysis proposed by Professor David Fidler and Professor Lawrence Gostin. This article finds that whereas the public health objective of the Act was to simplify the reporting process surrounding public health incidents under the International Health Regulations, the amendments made to the Act in response to national security needs have had the contrary effect of complicating public health reporting with marginal gains for national security. This article concludes that the concurrent pursuit of national security policy and public health policy is fraught with difficulty and suggests that the Act should be reviewed. This article considers whether the doctor–patient relationship should be classed as a fiduciary relationship. It considers the general principles surrounding fiduciary obligations, and establishes criteria around which the question of a doctor–patient fiduciary relationship is discussed, namely workability and necessity. In particular, this article discusses the types of conflicts of interest that arise in medical practice as well as the Australian regulatory framework in respect of the medical profession. The United Nations’ Convention on Biological Diversity (1992) (CBD) has become the focal point for the regulation of traditional knowledge (TK) held by indigenous and local communities (ILCs). The legally binding CBD is bolstered by a supplementary, nonbinding agreement, The Nagoya Protocol on Access to Genetic Resources and the Fair and Equitable Sharing of Benefits Arising from their Utilization (2010) (Nagoya Protocol). Both instruments create the conditions for the access and benefit-sharing (ABS) of genetic resources, and for TK associated with those resources. There has been no consideration as to how TK might factor into virus ABS arrangements. Most of the literature on these issues relates to how the TK provisions of the CBD and Nagoya Protocol should be implemented; there is little guidance as to how to interpret the text itself. This article provides a textual analysis of all provisions of the CBD and Nagoya Protocol that relate to TK and the interests of ILCs. The analysis clarifies the differences in scope between the two instruments and will provide some insights as to how to interpret key terms, particularly “indigenous and local communities”, “traditional knowledge” and “traditional knowledge associated with genetic resources”. This is critical to understanding the obligations that apply to accessing virus samples that are regulated as genetic resources under the CBD. This article reports findings from an ethnographic study that explored the meaning of “therapeutic” in the Alcohol and Other Drug Treatment (AODT) Court in New Zealand. Descriptions are provided of the therapeutic framework called ngā whenu raranga/weaving strands that resulted from interviews with court team members (n = 25), courtroom observations (200 hours), and document analysis. This includes the details of four strands; Law, United States Best Practice, Recovery and Lore that compose the framework. We argue that the therapeutic framework is simultaneously a philosophical and practical accomplishment and we provide brief examples of how the four strands are woven together, with each strand shaping the other, as the court team, participants and wider community interact together. The article concludes by considering the implications of the study’s findings, focusing on challenges that come with the widening of therapeutic discourse in the AODT Court. The High Court in D’Arcy v Myriad Genetics Inc (2015) 258 CLR 334;  HCA 35 addressed patent claims under the Patents Act 1990 (Cth) to deoxyribonucleic acid (DNA) sequences set out in tables listing nucleotides as As, Ts, Gs and Cs finding they are unpatentable. This was a significant development given DNA sequences have been patentable for decades. This article reviews the High Court’s judgments in D’Arcy v Myriad Genetics Inc highlighting the introduction of ambiguities to the current subject matter standards and providing a critique of the High Court majority’s assessment of DNA sequence as “information”. The article concludes that the High Court majority has introduced an unhelpful conception of “information” as a standard for patentability. While this will limit claims to DNA and other nucleic acid sequences, the broader effect of the decision is uncertain because the High Court majority’s conception of “information” could be applied to any matter (including all molecules) and eviscerate the patent system. Australian paramedics have always been regulated as an occupation despite a significant regulatory evolution occurring in their discipline. Paramedics have progressed from stretcher-bearers, ambulance drivers, ambulance officers and finally to paramedics. However, as the paramedic discipline evolved, paramedicine’s regulatory framework remained self-regulatory through employer governance which does not reflect the professionalised role of paramedics in society. The final step in securing professional regulation for paramedics is co-regulation under the Health Practitioner Regulation National Law Act 2009. Due to recent legislative amendments, paramedics will become a registered health profession in 2018. This article details the regulatory evolution of paramedic practice in Australia and how paramedicine has evolved beyond the current employer-based regulation to professional health practitioner regulation warranting a statutory framework of governance. Since the human genome was successfully mapped much academic attention has been given to ethical, legal and regulatory issues associated with the integration and application of genomics in health care. In line with the recent political commitment to promoting precision medicine that relies heavily on “omic knowledge”, it is timely to review the issues that this body of literature has addressed. Focusing on “pharmacogenomics”, this review quantifies the issues identified in this body of academic work. It reveals that, after nearly two decades, interest in the regulatory and legal issues associated with pharmacogenomics continues to generate significant attention. The ethical issues, while not as predominant, also persist. The analyses highlights that there is a dearth of empirical research exploring the impact that these issues have had. Within medicine, there has been a protracted conversation relating to the appropriateness of accepting gifts and incentives from industry, professional colleagues and from patients. The general principle and anxiety in this debate relates to answering the question of whether accepting gifts or incentives compromises a health professional’s duty to provide quality care. Within the dental profession, there is noticeably less discussion as to the effects of gifts and incentives upon the practice of dentistry. Given that dentistry is, like medicine, part of health care this status quo is not one that should persist. The authors hope that this article will stimulate discussion around dentistry’s relationship with those who might seek to make commercial benefit out of our practice and how dental professionals should respond to patients bearing gifts – letters to the editor are explicitly invited; personal communication to the authors to compile a follow-up publication is welcome. Research focusing on disciplined health practitioners is growing though exploring lower level decisions is also important. This study examines the outcomes and characteristics of psychologists subject to formal notifications between 2004 and 2015. Data were extracted from archived notification files (N = 396) held by the New Zealand Psychologists Board alongside publically available decisions of the Health Practitioners Disciplinary Tribunal (N = 13). Annually, <2% of practising psychologists were subject of a notification. Outcomes varied by type of notification but the vast majority resulted in no further action either at initial triage or after further investigation. Notifications involving psychologist scope practitioners and those with overseas qualifications prior to New Zealand registration were significantly more likely to result in further investigation. All 13 prosecutions resulted in a finding of guilt. Further research is needed to explore risk factors and why female practitioners may be over-represented in cases of sexual boundary transgressions. Despite the enactment of civil liability legislation affecting claims for pure mental harm in many jurisdictions in Australia, the High Court decision in Wicks v State Rail Authority (NSW) (2010) 241 CLR 60;  HCA 22 has caused some concern that the economic goals underpinning the civil liability legislation will be threatened. In this article, the economic sustainability of the law of negligence with respect to pure mental harm is considered in light of three particular issues. The first is the High Court’s 2015 decision in King v Philcox (2015) 255 CLR 304;  HCA 19 in which the South Australian civil liability legislation was considered. The second is the threat to healthy insurance markets posed by the civil liability legislation itself as a result of inconsistencies between jurisdictions. The third relates to the threat posed by the civil liability legislation to the ability of the law of negligence to achieve economically efficient levels of accident and accident-prevention costs. It is argued that the civil liability legislation is not only not well-suited to achieve its primary goal of reducing the social costs of accidents, but may well be a greater threat to that goal than the common law. Australia’s intermittent attempts to legalise euthanasia are typically fraught with brief, polarised, and often sensationalised, public debate. Yet beyond the sensitive arguments in favour and in opposition of reform, the practical antecedents of change that may determine Australia’s genuine aptitude to enact reforms have been largely neglected. Phronetic legal inquiry thus offers insights into the euthanasia law reform experience, using Australian and international case comparisons to examine covert power dynamics, cultural discourses, and social and institutional structures that affect the practices of the legislature. On this basis, it is argued that Australia’s medical profession, and particularly its dominant providers of palliative care, are hampered by an entrenched culture of medicalisation and paternalism, within which patient autonomy provides only a veneer of self-determination. This can be strikingly contrasted with the Dutch approach of patient-centred care, which seeks to produce collaborative, respectful dialogue between physician and patient and to integrate the principles of autonomy and beneficence. Furthermore, these contrasting medical cultures represent issues in the broader policymaking context, as Australia’s health policy remains unduly subject to the pressure of unrepresentative yet influential conservative interest groups, most prominently including the Australian Medical Association. This pressure serves to suppress public opinion on the issue of euthanasia in a parliamentary climate that remains stifled by bipartisan alliances and political inertia. 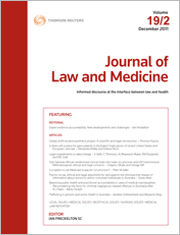 It is therefore argued that Australia’s prospects for successful voluntary euthanasia law reform rest on the dual pillars of developing a more patient-centred medical culture and challenging the prevailing paternalistic approach to health policymaking in Australia’s currently unrepresentative political landscape. For the PDF version of the table of contents, click here: JLM Vol 25 No 3 Contents.